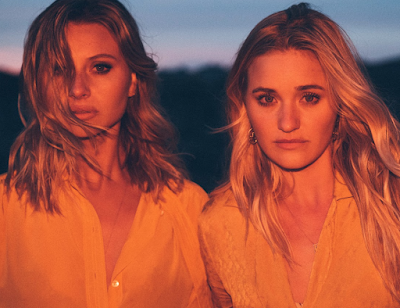 Musical duo, Aly + AJ, who have sold over 2 million records worldwide, return today after a 10 year musical hiatus, with their brand new track, "Take Me". “This is just the start,” muses Aly Michalka, who, along with her sister AJ Michalka, exude an excitement impossible to ignore. Their energy completely renewed, the track, "Take Me" exudes that same vigor - it's teaming with a slow burning restlessness that’s nestled amongst textured melodies and 808 drums, with nostalgic synth hits. 10 years prior, the girls were in a different place. “Aly and I felt personally discouraged by music in general,” explains AJ on their time away from songwriting. “We still had so much to prove to people, even though we had made a mark in the industry. It honestly was overwhelming,” she adds. The duo are no strangers to success- they first made their mark with their 2005 gold certified debut record, Into The Rush which debuted at number 36 on the Billboard charts. They followed with their sophomore effort, Insomniatic, which peaked at number 15 on the Billboard charts. Amassing a global following and constantly touring internationally, the duo were hit with various frustrations, from projects being put on hold due to their acting careers, to songs leaking on line. Stemming from that, the girls felt the pressures of conforming to a mainstream high-gloss sound that just wasn't them. AJ explains- “That’s not who we are - we were uncertain that we’d even be heard among the masses - we just weren’t writing that kind of music. We felt like, what’s the point?”. The duo needed time away - music no longer brought them joy, so they spent the last decade pursuing other creative projects. “People have been wondering what took so long - and it sounds horrible - but music became an enemy to be honest. We were scared to write, we didn’t like what was coming out of our instruments - it felt like we weren’t going anywhere,” adds Aly. “Once we were able to embrace who we were and once we started writing again these last few years, we were able to find the direction we naturally lean,” she explains. Their new direction is startlingly honest and a bold statement sonically. With their signature sound at the core of each track, the duo have experimented with wistful synths and breathy vocals.